Our steel milled studs are manufactured from 1215 steel. These studs meet ASME B18.8.2 material specification. These studs are not heat-treated. Also known as tap-end studs, steel milled studs are well suited for applications involving extreme friction and vibration. Our steel milled studs come standard with a Class 5 thread fit on one end, and 2A thread fit on the opposite end. This design helps to provide self-locking, friction-fit for the stud, which in turn enables excellent mechanical performance. 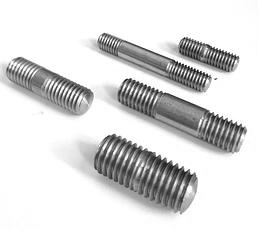 Since they are stationary, milled studs provide greater clamping loads with ease by tightening the bolt. Milled studs are equivalent to guide pins during component installation. The studs are used to securely hold different items in place; after the parts are properly aligned, nuts and other items can be easily installed. The steel material of these milled studs is resilient enough for the most demanding applications. Our steel milled studs are highly resistant to rust and corrosion. Our steel milled stud products are available in various lengths and diameters and adaptable to all national and international standards. Browse the Suburban Industries Catalog to learn more about the sizes and diameters of the steel milled studs we supply. If you need steel milled studs with different specifications, that’s not a problem—contact us to request a custom quote. Our team is more than happy to manufacture the particular custom milled studs you need, and our products are shipped quickly and efficiently.